GEORGE TOWN Penang is set to see the entry of yet another five-star resort to meet continued tourist demand. 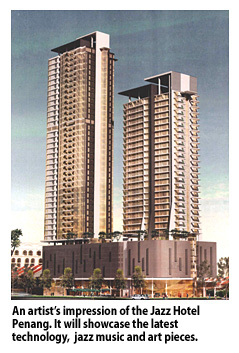 The RM100 million sea-fronting Jazz Hotel Penang will open its doors by 2015, its operators said. Full-service hotel management company Ri-Yaz Hotels and Resorts Sdn Bhd will manage the 226-room hotel, located at Tanjung Sri Pinang in Tanjung Tokong. "Our expansion into Penang is timely, given the growth of the northern region's tourism industry and our projected increase in demand for hotel rooms in Penang," Ri-Yaz's managing director Datuk Shaheen Shah said in Penang yesterday, after the company signed an agreement with Sure Commerce Sdn Bhd. Under the agreement, Sure Commerce will develop the Jazz Hotel Penang, comprising two towers which will be made up of the 30-storey hotel, along with service suites in the adjoining 45-storey tower. Witnessing the signing of the agreement at the Eastern and Oriental Hotel were Yang diPertua Negeri Tun Hamdan Abdul Abbas and Emkay Group chairman Tan Sri Mustapha Kamal Abu Bakar. "We purchased a 0.91 ha piece of land close to Tesco from Koperasi Gabungan Negeri Pulau Pinang," Sure Commerce's managing director Todd SB Teoh said in an interview. He said the Ri-Yaz group was chosen based on its proven record in managing boutique hotels in key tourism markets. Meanwhile, Shaheen said the group will draw from its experience in managing leisure properties in Malaysia like the Cyberview Resort and Spa in Cyberjaya, Ri-Yaz Heritage Marina Resort and Spa in Terengganu and Belum Rainforest Resort in Perak. Internationally, Ri-Yaz also manages the Pure Villas in Canggu Bali, Indonesia. "Over the next three years, we are looking to expand our footprint by investing and managing properties in Tuaran, Sabah, Langkawi and Kuala Lumpur," Shaheen said. "The Jazz Hotel Penang," he noted, "will be positioned as a trendy chic hotel, where the latest technology will be showcased, and where jazz music and art pieces will enhance the hotel's contemporary design." Also included in the design for the new hotel, are a sea-fronting roof-top pool, along with a glassed-ballroom. SINGAPORE: Real estate developer, Mulpha Australia Ltd, is seeking high net-worth individuals, especially from Singapore, Hong Kong and Shanghai, to purchase five units of its ultra-luxury residences on Australia's premier island resort of Hayman. Each of the units has an estimated value of A$20 million. Mulpha Australia is a wholly-owned subsidiary of a Malaysian-based, Mulpha International Bhd. Mulpha Australia purchased Hayman in 2004. The Head of Hotel Investment for Mulpha Australia and managing director of Hayman, Lloyd Donaldson said the residences, represent the first private ownership opportunity ever offered at Hayman. One of the top resorts of the world, Hayman Island is located 33 kilometres east of Australia's North Queensland coast, nestled between the coast and the Great Barrier Reef in the country's fabled Whitsunday passage. Within Hayman, stylish elegance reflects the harmonious freshness of the tranquil surrounds. "I've got the development approval for 20 units of these homes. But at this stage, we are going to develop only eight homes. "I have already sold three, so I have five (units) available," he told Bernama in an interview. Donaldson said the homes are designed by internationally renowned Singaporean architect, Kerry Hill. "The houses are approximately 1,000 sq metres and the land at about 5,000 sq metres. The houses are also about 88 metres above sea level, having a sweeping view of the entire Great Barrier Reef. "The type of buyers we are looking for are, ultra high net-worth individuals, looking to purchase a legacy asset," he added. Donaldson said the homes, now under construction, will be ready by the middle of 2013. He also said that the buyers can make use of the facilities at its 210 suite resorts. Hayman Island is also a great attraction for the rich and famous as well as honeymooners.